For the love of God, bar owners! Train your employees not to liken beer to domestic violence. I used to say that teachers were the most irresponsible Facebook user group. Now, I’m leaning towards the bar and nightclub industry. 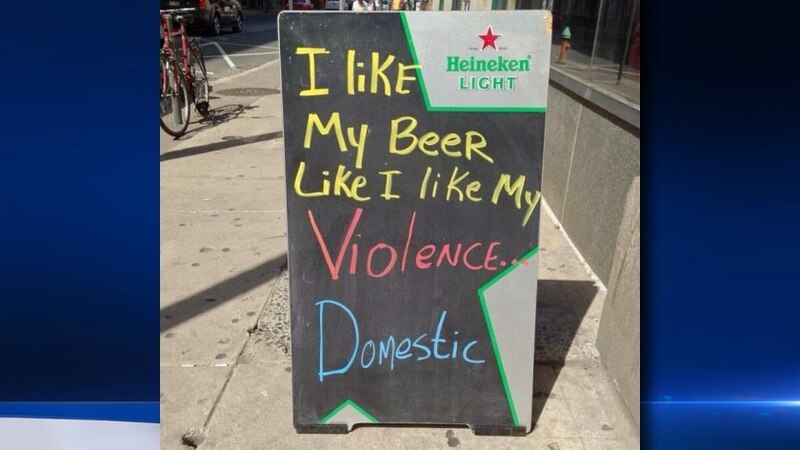 Last month, a worker at a downtown Philadelphia bar displayed a Heineken chalkboard with the message “I like my beer like I like my violence… domestic.” to attract customers. But, instead of achieving its desired effect, a passerby tweeted the photo to a local news station and a major cluster of a poopstorm ensued, which culminated in the worker losing his job. Within the past week, two states have passed laws, which will provide employees with more workplace protections. Truth be told, I wasn’t sure that the internet had yet arrived in either Oklahoma or Louisiana, the latter of which is still controlled by a French monarch, I’m fairly certain. (But since Louisiana also has beignets and Mardi Gras, all is forgiven). Maybe, starting the workweek off with the Employment Law Blog Carnival: Small Business Edition over at the Employer’s Corner Blog will cheer them up. Should U.S. employers provide “paid menstrual leave”? In Friday’s edition of The Atlantic, Emily Matcher’s “Should Paid ‘Menstrual Leave’ Be a Thing?” was shared over 12,000 times. The article notes that several Asian countries including Taiwan, Japan, South Korea, and Indonesia, offer “menstrual leave” for women endure painful periods. However, Ms. Matcher mentioned that, while many of these laws are “well-intentioned,” many women decline to take leave given the potential embarrassment of having to substantiate the basis for their “menstrual leave” or because they may be viewed as weak.